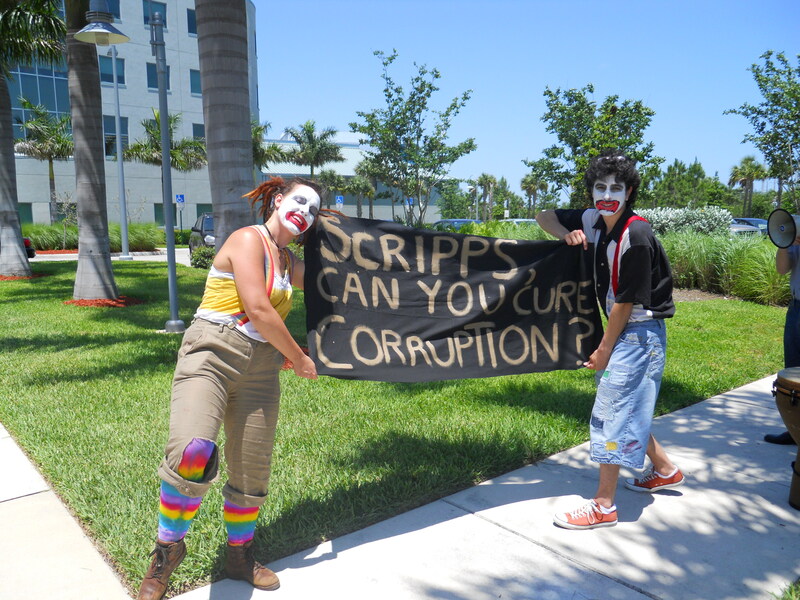 When Scripps Biotech decided to host a private 'Earth Day' event for employees at the FAU Jupiter labs, across the street from Briger forest, it inspired the clowns to make another showing... No one was arrested this time. April First Marks One Year Anniversary of Foolish Decision by Palm Beach Gardens Council to Approve Paving Briger Forest for Scripps’ Biotech City. Forest Defenders Celebrate With New Tree Sit And Legal Challenges at City Hall. 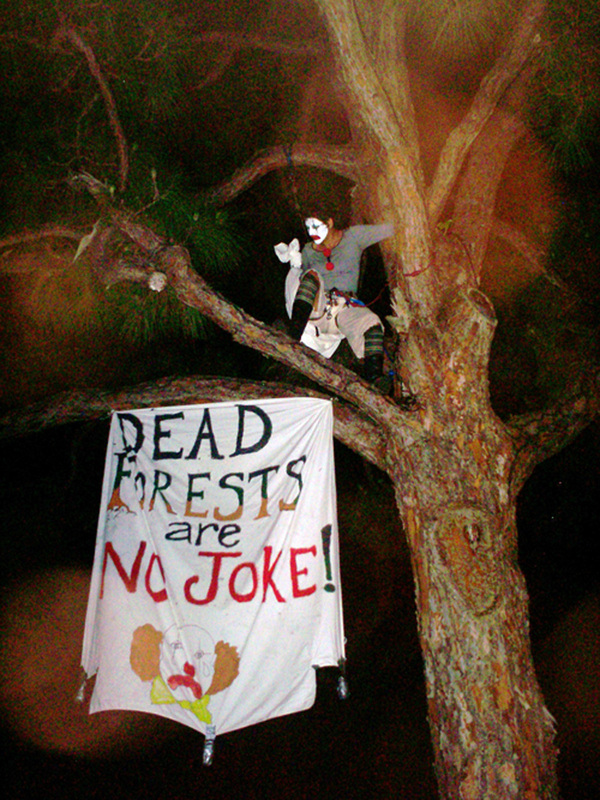 Palm Beach Gardens, FL—Forest protection protests continue to take to the trees. This time at Palm Beach Gardens City Hall (10500 N Military Trail). On April Fools Day last year, 2010, Palm Beach Gardens City Council voted in favor of the needed changes to their Comprehensive Plan to accommodate the Scripps Biotech Phase II plan, lead by Mayor David Levy. The new tree-top protest comes a week after Palm Beach Gardens Police arrested two tree sitters. The Police were also responsible for cutting multiple large native pine trees down in two areas of Briger forest—one of these being an area listed as a “preserve” in the Development of Regional Impact (DRI) permit, the other being in land owned by Palm Beach County taxpayers. Several members of the group have filed public records requests for details on the reason for tree-cutting. The activists have found that, according to Treasure Coast Regional Planning Committee staff, cutting trees in the designated preserve area constitutes a violation of the conditions of the DRI approval, which requires a “Preserve Management Plan” that will “enhance and restore” habitat. While the fight to protect Briger has not yet gained the momentum that resulted in Scripps being forced off Mecca Farms 5 years ago, it is picking up steam in that direction. The Palm Beach County Environmental Coalition, the Executive Committee of the Loxahatchee Sierra Club and the Conservation Chair of Audubon Society of the Everglades have all taken a position against the plan to clear Briger forest. These groups join Everglades Earth First! in opposing the current Briger plan and calling for an alternate plan which preserves and enhances the habitat quality, the recreational value and the educational opportunities that the forest provides. In 1990, Palm Beach County’s Environmental Resource Management (ERM) selected the Briger forest as a candidate for preservation through a bond to purchase land for protection. At that time it was called Indian Creek Flatwoods eco-site #23. While it was not selected in the final purchases, is was already recognized to be valued as endangered species habitat by ERM, over 20 years ago.